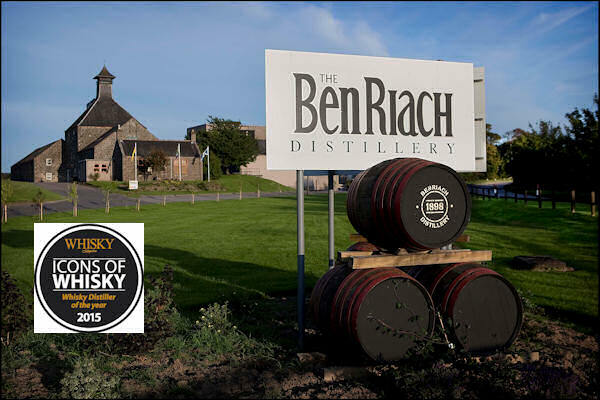 The BenRiach Distillery Company has been named Global Whisky Distiller of the Year at the 2015 Icons of Whisky Awards. The announcement was made last night during a ceremony at London's Waldorf Hilton on the eve of Whisky Live London. This latest award follows hard on the heels of BenRiach winning the “Icons of Scotland” Whisky Distiller of the Year earlier this year. First held in 2007, the World Whiskies Awards are Whisky Magazine's awards, searching for the very best whiskies in the world. And BenRiach had double cause for celebration last night, as it won Best Speyside Single Malt for the BenRiach 16 years old produced at its Elgin distillery. The winners were decided in online voting by writers, whisky producers and other industry leaders along with the editorial staff of Whisky Magazine. They were selected from three regional rounds of Icons awards covering Scotland, the US, and the Rest of the World. Founded in 2004 under the leadership of whisky veteran Billy Walker and his South African investors Wayne Kieswetter and Geoff Bell, the Edinburgh-headquartered company has grown with impressive speed, acquiring BenRiach that year and turning it into one of Scotland’s most admired distilleries. It acquired GlenDronach Distillery in 2008 and Glenglassaugh Distillery in 2013 as well as a bottling plant at Newbridge outside Edinburgh. All three distilleries produce unique award-winning whiskies with extraordinary depth, balance and character. Billy Walker said: “It’s a pretty amazing achievement for a small privately-owned independent company to win this prestigious global award. I’m especially proud that it highlights the innovations we’ve created at our three distilleries and it also quite properly recognises the high-quality, committed team we have built at our four locations. In August the company posted record pre-tax profits of £8.9m for 2013 boosted by unprecedented demand for its high-end whiskies in Asia, North America, Russia and Europe.